Tillandsias, or “air plants” have so many things going for them it’s surprising they’re not more popular. They possess a rare beauty that reminds me more of undersea creatures — or extraterrestrial flora — than jungle plants from Central and South America, the American south or the West Indies. As epiphytes they require no soil to grow, only a friendly host for latching onto, the better to take in moisture and nutrients from the air. Some tillandsia varieties bloom but I don’t seek them out for their flowers. As with succulents I love tillandsia’s for their looks; they have a singular beauty that enhances a display or vignette like no other plant. Still, despite all their positive qualities, tillandsias are not as popular as they could be. And, ironically, I think it’s these very qualities that hold them back. Their beauty is too “exotic”, too strange for most people. And, it seems to me, the no-soil bit causes confusion as well; if no soil is required where is one supposed to place them? One idea is to reference the way they grow in the forest, attached to a host tree. A recent piece in Sunset magazine titled ’11 Secrets to the Easiest Garden Ever” showed a gorgeous example of just that by my friend, garden designer Dustin Gimbel (click here). Inspired by his design I decided to try and come up some other displays for these amazing plants using elements I already had on hand. Tillandsia Palm Bow: Long-time readers of this blog will recognize the element at right as what I call a palm “scoop”. Dried and fallen on windy days, these curvaceous scoops are literally gifts from the sky. I’ve used them before, as a centerpiece (click here) and as a hanging succulent garden (click here). This one I found in the Evergreen Cemetery after a storm; it was just too gorgeous to leave for the gardener to discard. And, at more than 5-feet in length, it was much bigger (those previous scoops were about 2-feet long). I hung onto it for months, looking at it and others I’d salvaged, wondering what they might become. 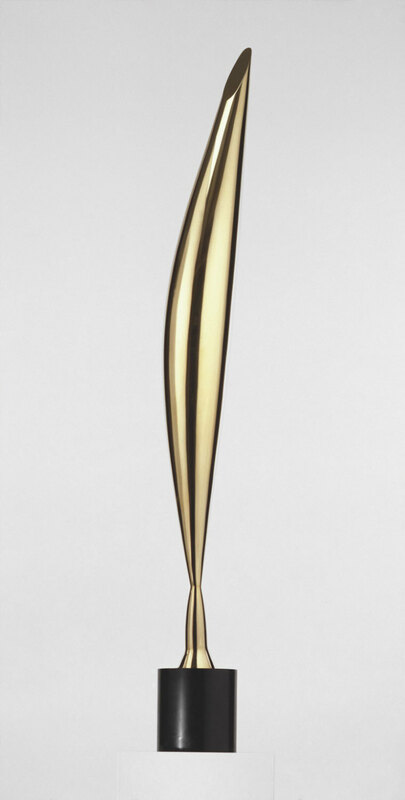 In a way it reminded me of Constantin Brancusi’s ‘The Bird’ sculpture (click here) … so I thought of adding a base to it and leaving it at that. But then I decided it could serve as a display for a large tillandsia Oaxacana. I filled a concrete tube with quick-set concrete, standing the scoop upright. My first impulse was to suspend the Oaxacana from a wire at the top of the scoop’s curve; then I decided I’d like the visual (and literal) tension a taut wire from the base to the top of the scoop would provide. This way I could hang the tillandsia from the wire and move it up and down as I pleased. A simple eye hook in the concrete, and another in the scoop’s top, did the job. I’m pleased with this tillandsia display. It’s simple but striking and a great way to elevate something natural that would otherwise be discarded. 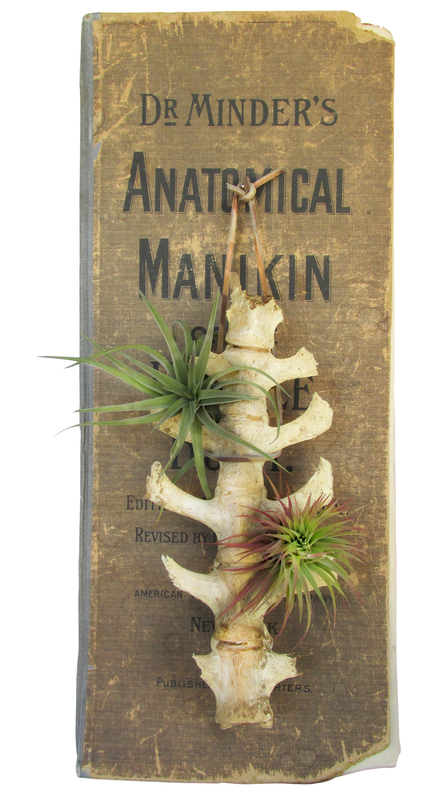 Tillandsia Spinal Suspender: Hanging from an very old illustrated medical text, this next display features one of those things I had to buy at the time but never thought I’d use in a million years: a length of vertebrae, (hopefully bovine). I found the bone-chain at Stephen Penn’s spot and it sat on my desk for a year or so as I pondered possible uses for them. Once I received my shipment of air plants I thought the bones would make a perfect perch for a couple of small but sprightly tillandsias. I was right: Nestled in the bone’s natural curves, tillandsia velutina (top) and tillandsia ionantha “fat boy” (lower) looked perfect together. All that was needed to turn the bones into a wall hanging was a strip of leather, looped and tied. This hanging display illustrates the fact that these odd looking little plants and a weathered patina are a natural combination. Tillandsia Heat: Another irresistible Stephen Penn buy, I had to have these vintage ceramic heater elements. I believe I actually bought these on the same day I bought the bones; I remember marvelling over their shared texture and color. 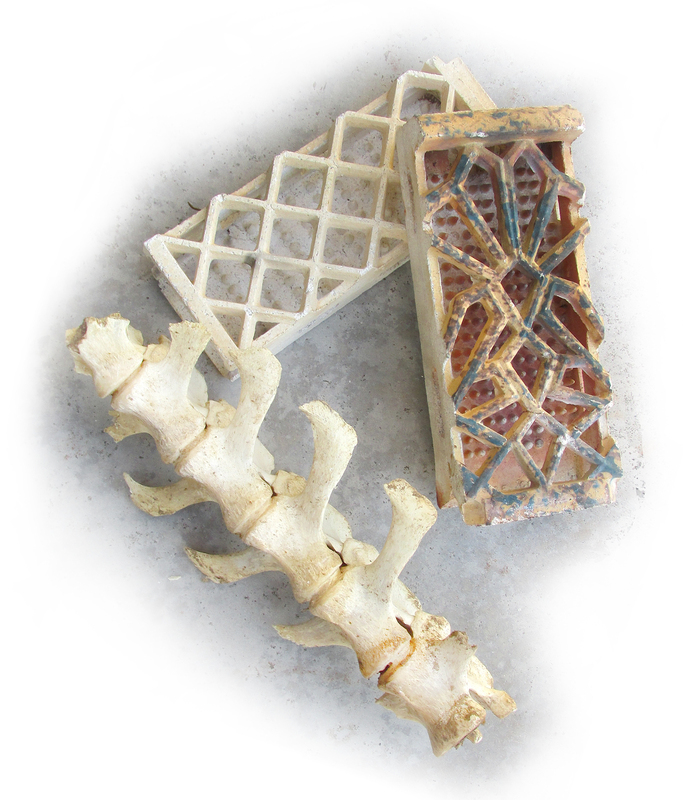 Like the bones, these little ceramic sculptures have lots of spots for tillandsias to nestle in. Unlike the bones, the elements feature a more geometric design. To create a hanger I simply passed a wire through the element’s sides and tied it off in back. Tillandsias used, from the top: tillandsia reichenbachii, tillandsia velutina; tillandsia usneoides (Spanish moss), tillandsia butzii, tillandsia ionantha “fat boy”. Like the spine hanger, these look great against the heavily patinated backdrop of weathered barn wood (source: Stephen Penn). 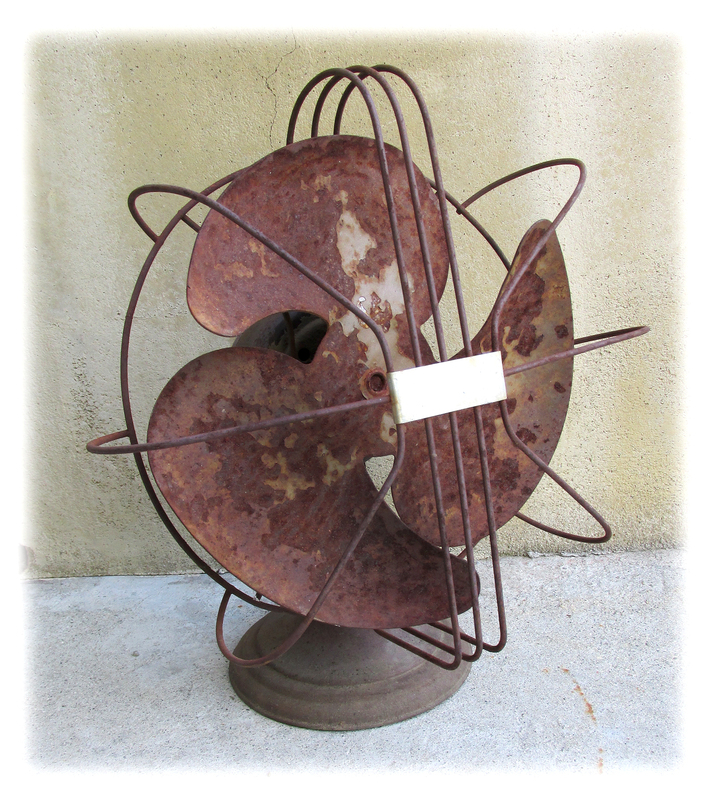 Tillandsia Fan: Except for its missing cord, this vintage fan is intact, and a beautiful study in rust. A Westinghouse Pacemaker model, it’s got the streamlined good looks of the art deco period. This find came from my picker friend and neighbor Susan’s yard; I only re-discovered it in a bag in the garage yesterday! 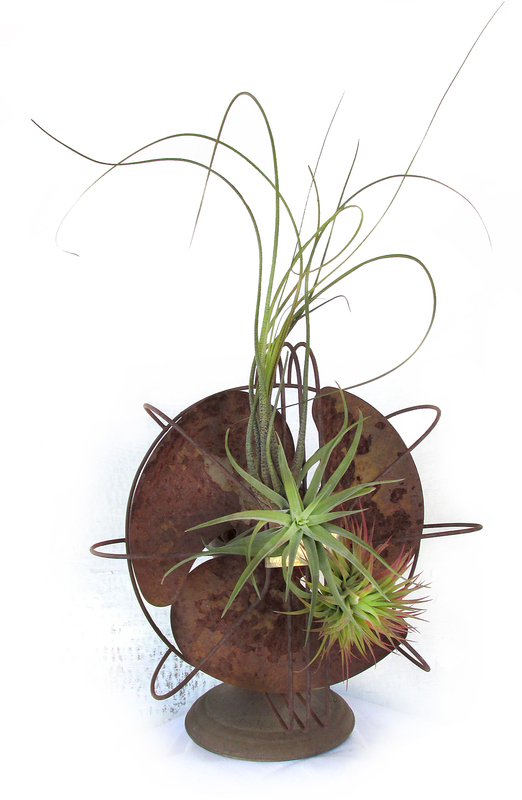 The geometric wire grill is no longer needed to protect little fingers but it makes a suitable hang out for several tillandsias; they are a large tillandsia butzii, tillandsia velutina, and tillandsia ionantha “fat boy”. The fan’s oscillating days may be over but it’s bringing the cool on my mantle. As you may have noticed, many of the amazing items used in this post came from Stephen Penn’s Art Garden. And, although an earlier post stated that they would be there through February only, they got a reprieve and are still selling the sorts of things that bring inimitable flavor to any home or garden. Their address is 6009 Jurupa Ave., Riverside CA. Because things are rather unpredictable for them right now it’s a good idea to call first; their number is 909.705.9736. Wow–the palm bow is my fave! I love the way the swoop of the palm mirrors (in opposition) the curve of the tillandsia’s leaves. There is so much motion there. And great observation about the simple geometry of tillandsia working so well against patinated surfaces and other simple geometric shapes. You have quite the artist’s eye. I’ve always loved these (a couple of lifetimes ago I had a tiny one that was stuck in a magnet-backed seashell) and I too wondered why they aren’t more popular. I think it might have to do with the small size of many tillandsias on offer. People don’t know how to use them without their getting lost? We have ball moss in our live oak trees and I collect fallen plants and tuck them into a bit of trellis over a birdbath here. Not nearly so striking as your thoughtful arrangements, but an homage regardless. Great post! Wonderfull. I, too, love the look of the unusual, sculptural, look of these plants. Once again your creativity and ability to follow-through on what you envision is marvelous! Thanks, Loree, I really appreciate your follow-through observation … And, you’re right, the care and feeding of tillandsias stumps people, myself included! Reuben- you are so creative! I’ve often wondered what to do with those palm sheaths and you came up with a use both sculptural and functional. Looks like we can call it ‘California Botanic Modernism’??! And the rusty fan- you have such a vision! I enjoyed seeing these. Thanks so much, Burnel. I’ve got two more “sheaths”, as you call them … I guess I don’t need to tell you I’ve got plans for ’em! All your creations look great. I’m doing better at not killing my tillandsias. I got mine at the U.C.R. plant sale. Which is coming up the 28thand 29th. Goodie! I love going to see what I can find that I don’t have. And with so many choices I’m sure to come home with something. Hi, Vickie … I’ve never seen tillandsias at the UCR sale but then I didn’t go to the last one. I’ll definitely look out for them. And thanks for the tip-off on the upcoming sale! Your sense of style and design is first-rate. Great stuff. I have to say that since I was an Xray tech (many years ago), my favorite is the vertebrae. However, I love all of your arangements. There are several different varieties here, so I feel lucky. All I do is let mine soak in tepid water for 10 to 15 minutes and then shake out the excess water…… They don’t like to have their feet in water. And thanks for your real-life story living with tillandsias, Val! Amazing! The palm bow is my favorite! Do you know of anywhere that you can purchase those palm seed pods? I have searched high and low for them and cannot find them. If anyone else knows, please email me at LowcountryJudi@aol.com Thank you! Gracias Señor por éste blog tan Interesante, porque yo como Usted, amo locamente las Suculentas y siento que acabo de descubrir otra gran pasión por éstas plantas aéreas tan interesantes, de hecho ya tengo unas cinco y no sabía o no me había fijado que había tanta variedad. Por favor no deje de escribir. Gran abrazo. Deyssi María Beltrán de Bogotá Colombia. Muchas gracias por su hermoso comentario. Voy a seguir escribiendo, pero en una escala más pequeña a través de mi página Instagram. Voy a seguir centrando mi atención en las suculentas, así como la miríada de otros intereses que disfruto. Buenas fiestas, Reuben Muñoz.